Founders pay a lot of attention to Minimum Viable Products, or “MVPs”. However, for all of the attention that’s paid there seems to be just as much confusion about what an MVP exactly is. Despite the name, MVPs aren’t intended to actually be viable products. MVPs serve one purpose and one purpose only…to validate a specific hypothesis. Sometimes that means you need to release a product to the market to validate that hypothesis, but usually not. What this means is that most early MVPs actually aren’t viable in the marketplace. In fact, they’re usually not even products. Let’s dive a bit deeper into this. Often when you first begin work on your product the hypotheses that you’re validating are less about specific features that would be tested with a build and more about your overall product direction or business model. These are the “would you pay for this questions” that underly all assumptions about your product from the outset. And, these are the most important assumptions that you need to be validating with your early MVPs. So, how do you validate these early hypotheses? You do so with the most lightweight MVP possible…a conversation. You don’t need a functioning app, or even a prototype, to be able to have an early discussion with a potential customer about the validity of your idea. Often, you just need a list of questions and a sketch on a napkin. If this list of questions and sketch helps you to test whether or not your hypothesis is valid then this is your MVP. Could this list of questions and sketch be considered a product? Probably not. Would it be viable in the marketplace? Absolutely not. But, it’s well suited to validating the specific hypothesis that you have at that moment because this hypothesis is about your overall vision for your product and where it fits in the market…not about specific features. So, if an MVP is not always viable in the market then what is? The MMP. 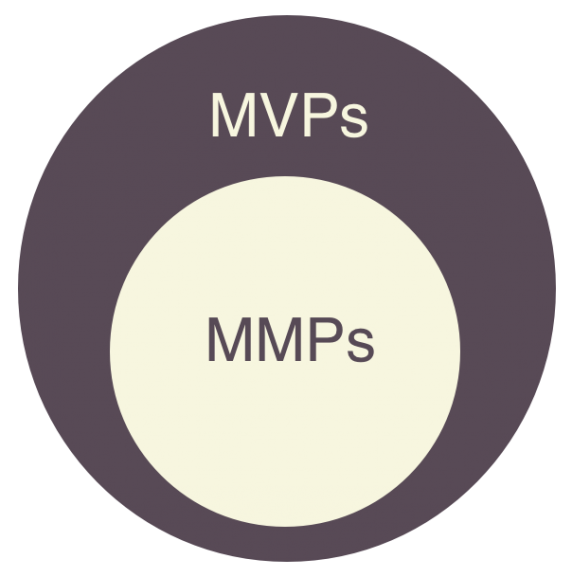 An MMP, or Minimum Marketable Product, embodies what people often think of when it comes to MVPs. An MMP is the smallest possible product increment that could conceivably be viable in the marketplace. Is a list of questions and a napkin sketch a viable product in the marketplace? No. But the first build of that product containing the bare minimum of features may be. Often when we discuss adding only enough features into our product to create an MVP, we’re actually referring to an MMP. We use MVPs to prove a hypothesis that we’ve set for our product. 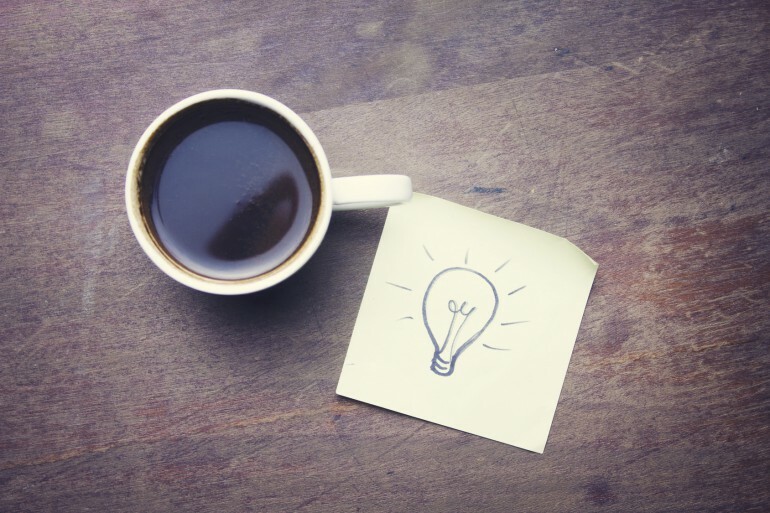 Depending on the nature of that hypothesis our MVP may be a sketch on a napkin, a landing page that collects email sign ups, or even just a cup of coffee and conversation with a potential customer. It doesn’t matter what form they take, as long as they can be used to validate a hypothesis and move your product forward. Once our hypotheses have matured to the point that we’re now testing actual features our MVPs start to become viable product builds, often in the form of MMPs. Although an MMP will be more refined than the MVPs described above it can be just as useful for validating a hypothesis about your product. The point we must remember, however, is that shipping a full fledged product to validate a hypothesis will take much more time and effort than walking a napkin sketch to a coffee shop. This means that we should always be asking ourselves if we’re using the absolute lightest weight MVP possible to validate that hypothesis. In the end, it all comes down to the nature of the hypotheses that you wish to validate and where you are in your product life cycle. Early hypotheses concerning your vision or market fit can be much more effectively validated using a simple MVP. This is because their lighter weight and more malleable nature will allow you to get feedback sooner and more easily adjust course if you take a misstep. Later hypotheses concerning specific features, distribution channels, or platform decisions may warrant the investment in an MMP. But your goal is to delay that investment as long as possible until you’ve proven as many of your initial hypotheses as possible using other means. Want to learn more about how to create great products your customers will love? Check out my course series, Using the Scrum Framework from Pluralsight, to learn how to set yourself apart as a Product Owner and help your team deliver the products that will truly value to your organization. If you’re building a product then you want users…it’s that simple. And you want these users as soon as possible because the earlier you can get users, the sooner you can get start to get that feedback that will be so crucial to your product’s success. These first users are your early adopters and the feedback that they provide will be instrumental in the early stages of your product. But as much as you need your early adopters there’s one thing that you must remember about them: your early adopters are not your mainstream users. Sure, there may be overlap. And sure, with any luck, some of your early adopters will grow alongside your product into your mainstream users as your product matures. 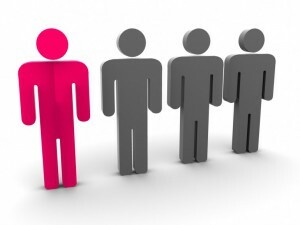 But, more often than not, early adopters are an entirely different breed than your mainstream users. 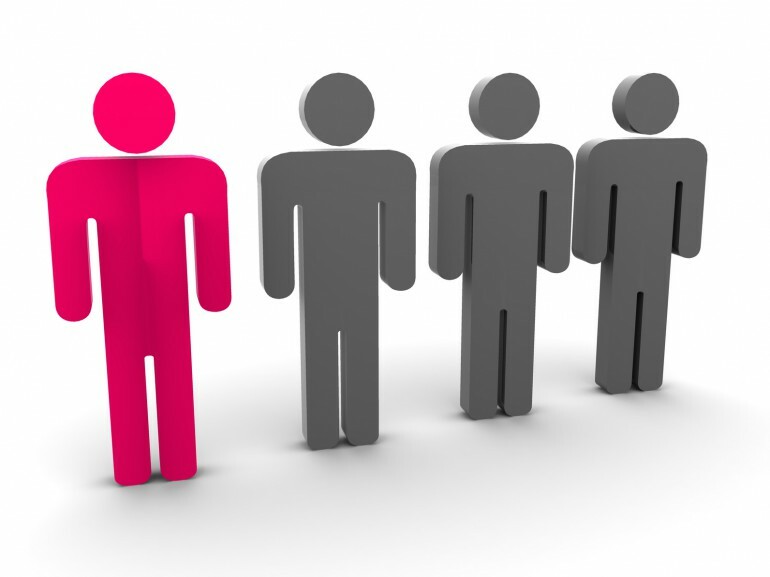 Early adopters tend to have different needs than mainstream customers. On the surface, both groups may be solving the same problems but by their very nature early adopters are more adventurous and are willing to put in more of an effort to do so. And, while everyone wants a great experience, early adopters tend to be more tolerant of the occasional bug or odd usability choice. But there’s an emotional component at play here, as well. Often early adopters are just as attracted to your product for the fact that it’s new as they are for the underlying problem that it solves. This newness is exciting in its own right and, in large part, drives their use of the product. But this “I used your product before it was cool” quality isn’t a quality that you can count on to drive usage as a your product matures. Mainstream customers are less drawn to a product for its newness but are also less drawn by the product’s feature set. Since this may be surprising, let me explain. Mainstream customers don’t buy a product because of its specific features, they buy a product because of the specific problems it solves. This doesn’t mean that all of the same features that were compelling to early adopters aren’t also compelling to your mainstream customers, but it does mean that these feature aren’t likely to be the deciding factor to whether they make the jump. Expanding on this, your mainstream customers will have much mess tolerance for the same bugs and usability issues that your early adopters had. Whereas your early adopters viewed rough corners and hiccups with your product as a fair trade for getting access to a new and exciting product early your mainstream customers won’t be so kind. These users will expect a complete and polished product that functions out of the box. And, to the same end, while an early adopter may be willing to invest some time fiddling with and configuring their own experience, a mainstream customer will want an experience that fits their needs on day one. So, why does this matter? This matters because if you expect your product to grow you’ll ultimately need to make the jump from your early adopters to your mainstream customers. The catch, however, it that the same qualities that appealed to your early adopters may not entirely align with the same qualities that will appeal to your mainstream users. Therefore, you may have to make the decision to alienate some of your early adopters, who have been with since the beginning, in order to grow to the mainstream. To this end, you’ll also want to be cognizant of catering too much to the early adopters in your roadmap. You’ll want to measure every step of the way once your product hits the market but beware of blindly following those metrics. Don’t double down on features or trends that have had a lot of uptake in your product by your early adopters but aren’t likely to appeal to your mainstream customers. By the same token, evaluate judiciously the decision to drop any feature with little uptake by your early adopters that potentially may be a play towards the mainstream market. Product development is a journey. On that journey you’ll encounter many customers all with different needs. Don’t forget your early customers and the lessons they taught you at the beginning but don’t become trapped by those same customers, either. By learning to tell the difference between the needs of your early adopters and the needs of your mainstream customers you’ll know when it’s time to take the next step in your product’s journey.